The "From Earth to the Universe" exhibition (FETTU) has opened outside the Smithsonian's National Air and Space Museum in Washington, DC. 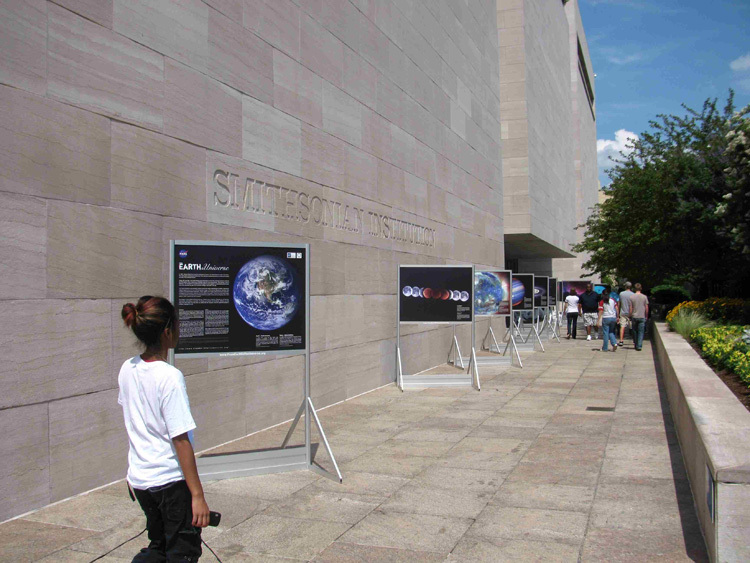 This display of some 50 large-scale astronomical images will be available to the public through the end of July. Also arriving in Washington, DC, later this month will be FETTU panels for the visually impaired. These panels will feature tactile displays of the images as well as Braille versions of the caption material. The exhibit will open on July 18th at the DC Public Library's Martin Luther King Jr. Memorial Library, located at 901 G St., NW, in cooperation with Columbia Lighthouse for the Blind and the DC Regional Library for the Blind and Physically Handicapped, and run through mid- September. The exhibit will be located on the 2nd floor West lobby. For library hours, visit www.dclibrary.org, or call 202-727-0321. FETTU is a global cornerstone project of the International Year of Astronomy 2009, a worldwide effort to promote astronomy in the 400th year after Galileo. As the name suggests, FETTU is an image collection of astronomical objects ranging from our home planet through the Galaxy to the farthest corners of the Universe. These images contain data from both telescopes on the ground and in space that observe in many different types of light – from radio to optical to X-rays and beyond. The arrival of FETTU at the National Air and Space Museum highlights the midpoint of the journey for this traveling version, supported by NASA, which has already made stops in Tucson, AZ, Memphis, TN, and Anchorage, AK. Additional venues for both the outdoor exhibit and panels for the visually impaired are being scheduled for the rest of the year. Globally, there have been over 250 FETTU exhibits in more than 60 countries -- and on every continent except Antarctica -- around the world thus far. The venues hosting FETTU have been wide ranging, from parks to community centers to libraries to art festivals and beyond. These worldwide exhibits have been funded through a variety of local resources and are organized by each individual location. For a full list of known FETTU exhibits - both in the US and internationally - visit http://www.fromearthtotheuniverse.org/table_events.php. The goal of FETTU is to engage the public - especially those who might not think they are interested in astronomy or science - through the stunning beauty of astronomical images. Short and informative captions on the panels, as well as a comprehensive website, are available to help the viewer become introduced to the science behind the aesthetics.